On macOS, we removed the confusing "Paused" status on the YP tray icon. Your activities are tracked automatically when the app is open in the background, even if you don't track any tasks, so this status was not true. By the way, did you know that you may add tasks retrospectively? Just select any time range on the chart and press "assign to a task". We're going to add the option to store your data on your computer and not on the servers. It will allow Y-Productive for a complete offline work and will be a nice addition for everyone who wants to keep their data closer to the body. In future, it will become the "off/on" option to let you choose between the synchronization on different machines and the bulletproof local data security. One of the most demanded features recently. We expect it to ease life for everyone who wants to keep track of the work that includes being off the computer or wants to create the most accurate Reports for themselves or for the clients. In addition, we'll add "brush" to the chart, so you'll be able to select any time range you need. 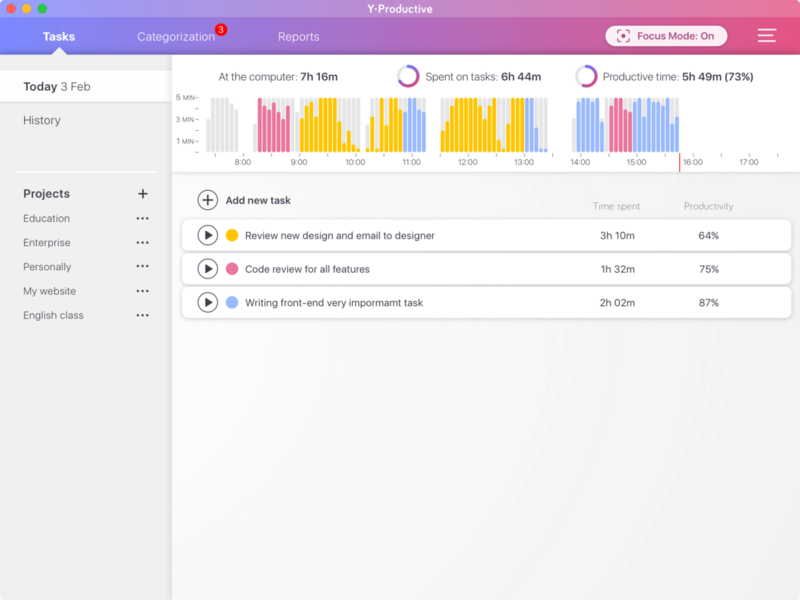 Categorization Profiles, more insightful Productivity Reports (summarized stats for websites/apps for week/month), Goals, Pomodoro timer. We consider the feedback in a first place every time we decide on what to build next to make the Y-Productive an even better app for your work. Task`s working days attribute now works properly - server sync fixed. Categorization reworked: categorization copying removed. In case you're wondering "WTF is GDPR", just google this exact phrase. We're sure everyone has had enough hearing about it but hey - isn't transparency a good thing? Improved Facebook login experience (added friendly error messages). That means that login via Facebook will become more smooth, but if you experience an error - it will be friendly enough to let you know what exactly happened. Changed the AFK settings text from "Stop task after you've been away for" to "Stop tracking after you've been away for". Now this option reflects both manual task/and autoamatic non-task tracking. The chart now detects your idle time and stops tracking automatically. You can setup the required idle time in Settings menu, the option: "Stop task after you've been away for:"
Hint: You can change it to a max time before AFK if you spend a lot of time on meetings (which is usually an idle time at your computer). You can turn the website blocker on/off even if you have no active tasks. There is a shortcut for it, you can change it in Settings menu. Hint: By default, Focus Mode is on when you start tracking a task. You can setup your preference in Settings, option: "Tasks trigger Focus Mode". Now you can receive even more insight into your work behavior at a glance. 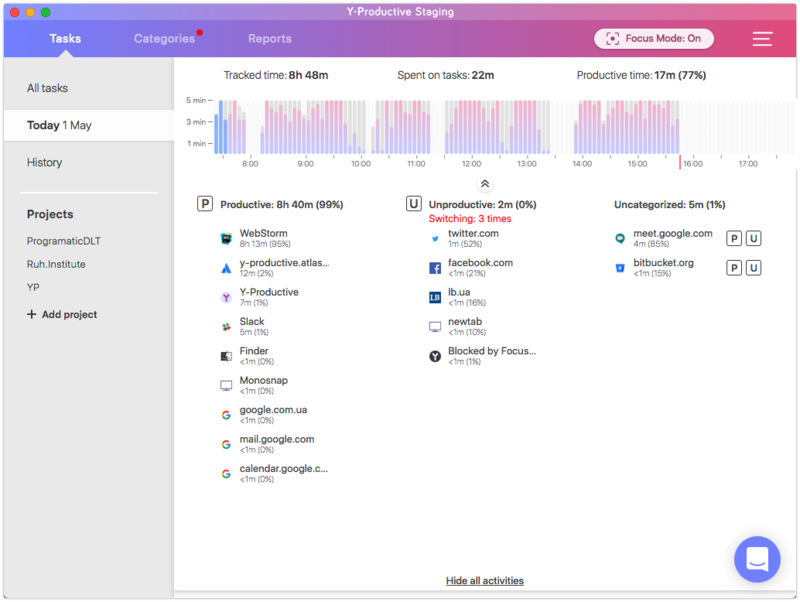 This feature displays all the websites or apps you used during the day, time spent on productive and unproductive activities and the summarized number of your distractions per day. You can hide it, have it semi-open to work with tasks or open to the full screen by clicking the button in the middle. Hint: You can view your past day activities in a History tab. With this feature, we added the Quick Categorization buttons. New activities will show up as Uncategorized. You can quickly mark them as Productive or Unproductive one by one or several in a row. There is a 2-second delay in case you change your mind or missclick. Click-click and you're all done! Fixed critical bug that caused app to crash (grey screen). Manual task tracking provides a lot of control over your behavior, sets your actions a meaningful work context and cuts off the unrelevant data. But sometimes we just forget to push that button. We took care you'll feel safe about it. You just need to have the application open in the background. The automatically tracked data is indicated by the gradient colored bars. If needed, you can assign it to any task retrospectively. Doing so will match the gradient colors with the appropriate task. 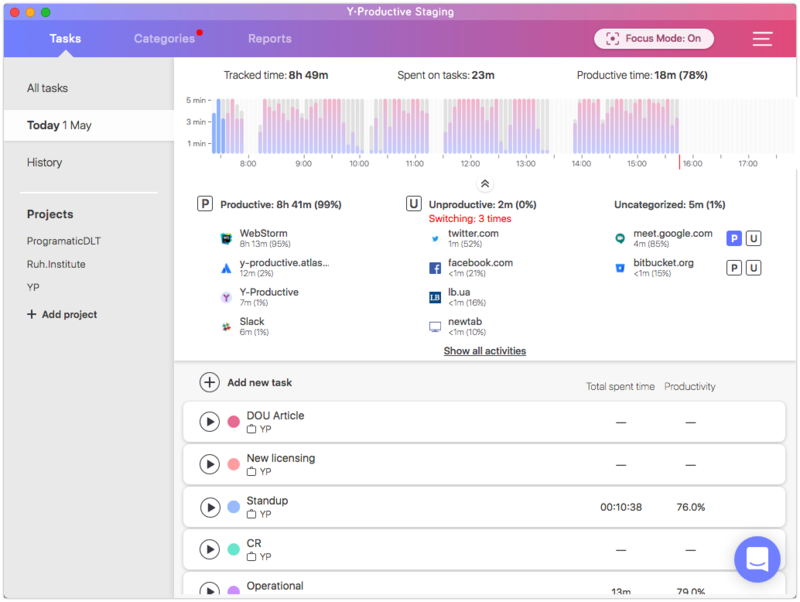 As usual, you still can manage and track your tasks to receive statistics for Projects and Productivity reports, and to add work context to your performance feedback. 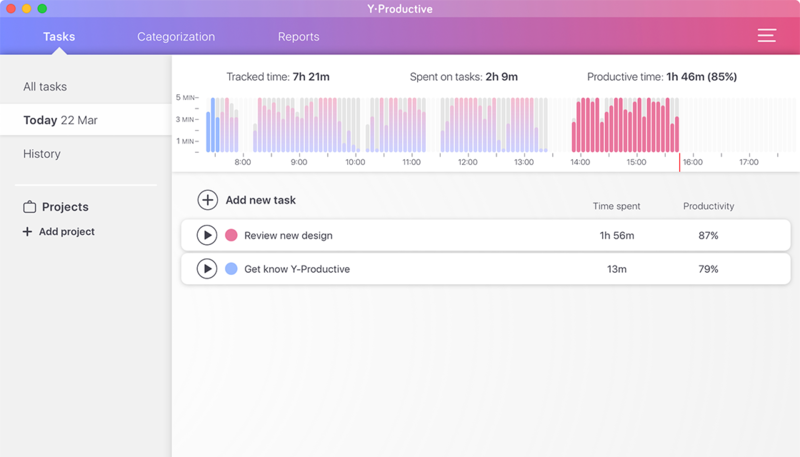 Y-Productive is now a truly unique tool that combines the benefits of an automated time tracking, task management and provides a deep insight into your productivity in a comprehensive and simple way. Hope you'll like the changes! Let us know what you think about the update in Intercom! Surely Y-Productive will start publishing changelogs very soon.